Dr Duncan McCuaig founded the Durham and Yorkshire Golf Club in 1874; this was the first golf club in the North East of England and originally it was laid out as a 14-hole course. Other golf clubs in this area were formed towards the end of the 19th century, so in 1887, the club changed its name to Seaton Carew Golf Club. The course was extended to 18 holes in 1891. Another doctor called MacKenzie came along in 1925 and modified the layout. Ten years later, Dr Alister MacKenzie went on to design Augusta National, home of the Masters. Continuing the doctor theme, the 3rd hole called “Doctor”, a short par three, remains as per its original design and serves as a tribute to Dr McCuaig, Seaton Carew’s founder. 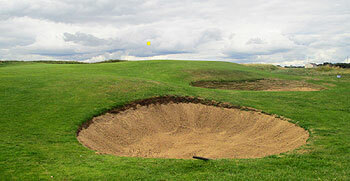 There are now 22 holes at Seaton Carew, following Frank Pennink’s addition of four new holes. The members now have a number of playing options. The Old course, an out and back layout, is the original MacKenzie design. The Brabazon course incorporates 14 of the original holes; Pennink’s four new holes come into play at the turn. The Brabazon, an uneven par 73 (35 out, 38 back), is now considered the championship course and is tougher and longer than the Old course. The club claims that it can make five different 18-hole layouts, but we're bemused as to how and why. According to Frank Pennink's Choice of Golf Courses: "Seaton Carew has the special merit of always being dry and playable, and four new holes near the sea should raise their already enviable status to a links of major championship quality. They will replace the 7th to 10th." Clearly the club decided to keep all holes open to confound all but the most knowledgeable scholars by devising a few too many permutations. In 1985, Seaton Carew hosted the Brabazon Trophy (English Amateur Stroke Play Championship), producing a tie for first place between Peter Baker and Roger Roper. Don’t be put off by the industrial surroundings of chimneys and chemical works; this excellent golf course is one of the best on the East coast of England, a real MacKenzie treat. There are a few ridges of sand dunes and the fairways undulate gently, but otherwise this is a relatively flat links course, always at the mercy of the wind. The 17th hole, called “Snag”, is one of many great holes at Seaton Carew. The late Derek Hornby, a historian and author of the History of Seaton Carew poetically describes the 17th. "The seventeenth's dangers are countless, beginning with whin, gorse and dune, the rough and gathering bunkers, and the green's undulating tune, to veer even slightly is fatal, the cost is distressingly high, many the card that's been torn up, just here with home oh so nigh". If you are in the north-east play this course. Very easy to deal with, very helpful in the shop and club house. I played on a sunny October day with a very stiff breeze. The playing surface from tee to green was in really good condition. The rough is intelligent, it is thick enough to be a penalty but not so thick that one has no chance of finding the ball. I cant recall a weak hole and cant wait to play again. Located close to Hartlepool in the North-East corner of England Seaton Carew, where golf dates back to 1874, has a reputation for being a bleak, chilly and grim links. I have played this austere course a number of times and can categorically confirm that on each and every visit… this has indeed been the case! Of course, I relate this to the weather and not the actually links itself which is superb. On my most recent visit it was one of the more pleasant conditions I have experienced here; the wind was gusting to a mere 75mph on this occasion. At least three of the flagpoles had lost their flags, balls were moving on every other green and sand, blown from bunkers, was constantly in the air as it swept viciously across the course on the stiff breeze. Come to think of it, I’ve always played Seaton Carew under a grey sky with a fierce wind howling across the links and a threat of rain in the air. Add to this a Nuclear Power Station and various other factories, which are a constant view on the horizon, with smoke billowing out of the many chimneys and you do indeed have a somber outlook. Obviously the weather isn’t always like that (I hope anyway) and what lights up this links is the quality of the golf. There are 22 holes in total which can be configured as five different courses but mainly done so as three; The Old, The Brabazon and The Micklem. Regardless of the composition you play it will provide a great and true test of your game. The holes are lightly bunkered from the tee but this is more than made up for close to and around the greens where approaching from the correct side is paramount, especially in the cross-wind that is often present. Fairways are relatively flat although some do play alongside and over ridges. The green surrounds and bunkering is of a particularly high standard as are the putting surfaces too. Seaton Carew may not be as easy on the eye or have as an attractive location as some other links courses, although there is some stunningly beautiful duneland behind the 10th green on the Brabazon layout, but there is a real masculinity to the course and every time I play it I come away with greater respect and admiration for it. Seaton Carew doesn’t quite make the top bracket of links courses in the UK but it is knocking on the door and is certainly one of England’s strongest venues. This is reflected in the number of championships it has hosted over the years. The Brabazon Trophy has been played here but this is just one of a series of R&A and England Golf events held over the years. I played Seaton Carew on a blustery April afternoon, accompanied by two club members (thanks for the round Mick and John!). Although surrounded by heavy industry and the Teeside nuclear power plant, the course is a wonderful links which tests all aspect of your game. Course conditioning was very good, with the greens especially in excellent shape. Located a reasonably convenient driving distance from Ganton and the moorland courses outside of Leeds (Alwoodley et al), Seaton Carew forms a very distinctive cog in a golf trip to NE England. The green fees are very reasonable, while the staff and membership are extremely welcoming. Put this one on your list if you enjoy links golf! We finally got round to playing Seaton Carew in early April on the way back from Fife. I am adjusting for the fact that I played like a drain and was soundly beaten and that our round was very slow due to being stuck behind a county match, but I must admit to being underwhelmed, certainty compared to some reviews claiming it should be top twenty in England. I'm not influenced by the industrial setting since both seascale and Silloth show that a great course doesn't need bucolic setting. The opening was plain and confusing, we're still not entirely sure which holes we played. It is one of those links courses where you neither see the sea nor experience much change of elevation. The par 3s were interesting however, and there is a strong if fragrant finish. If a 3.5 rating were possible I would give that, of its type, Goswick is a better course yet still only a strong 4. Worth playing but I feel it's very over rated. Great golf course that would be rated far higher if the views of industrial Middlesborough weren't with you on most holes. The par 3 third and the very strong par 4 10th and 17th were particularly memorable (Brabazon configuration).We played on a Monday 2 for 1 deal which made it £25 each. Only comparable value I have come across is Silloth and Seascale.Well worth the visit. In 1974, the club agreed to an oil pipeline under part of the course. The proceeds from this concession enabled them to build four excellent new holes on the eastern side, where the land was once covered by the sea. This gave them twenty two holes which are played in four slightly varied 9-hole sequences. ‘Doctor’ (2nd) is a wonderful par three, unchanged from 1874 except the sleepers in the bunkers have been removed. The green is elevated and has four bunkers at the front, two on the left and three bunkers plus grassy dunes on the right. ‘Lagoon’ (9th) exemplifies the precision shot making needed at Seaton Carew. All along the right is a large swampy area that runs to within about eighty yards short of the green. The last sixty five yards of the fairway are very narrow with thick grassy mounds along the left and back of the raised green. Normally the 17th on all four combinations, ‘Snag’ is one of the best holes. The green is raised with two bunkers on each side and at the front. There is a nasty, hidden bunker at the foot of the large mounds on the left edge of the fairway, about twenty five yards short of the green. I wasn’t really prepared for how good the Old Course at Seaton Carew would be and this mightily impressive track really surprised me! There may be no tall dunes to weave in and out of but there are plenty of subtle changes in elevation to sustain interest in the terrain from start to finish. And forget about the old, heavy industrial backdrop to the layout as you’ll need all your concentration to deal with the job in hand. An earlier reviewer mentioned how “everything was laid out in front of you,” well I’m sure elite golfers love to play here because of the intrinsic fairness of the design. Having said that, “Lagoon,” the par four 10th, was my favourite hole on the card, as its split-level fairway forces golfers into a semi blind approach to the green for tee shots played to the left of the hole. I also loved the strong finish to the round, where a trio of testing par four holes follow “Cosy Corner,” the third and final short hole on the course. I was told that most of the greens were dug up and re-laid under the watchful eye of a former St Andrews greenkeeper a decade or so ago and these big, wonderfully contoured putting surfaces are what really make the Old Course such a delight to play. Signage could be improved a bit in places as there are sometimes several options available when heading for the next hole but that’s a minor quibble when you can play one of the very top courses in northern England for a very reasonable green fee. I’d love to return again to play the four Pennink holes which are laid out closest to the coastline but until then I’ll remember the other eighteen holes at Seaton Carew very fondly. Stopped off at Seaton Carew on our way down south after a visit to Fife. The industrial landscape is quite prevalent but not off-putting and in fact usefully offers a myriad of points of aim. The course is on a relatively flat piece of land but has nicely undulating fairways. Overall course condition was excellent with the greens at a nice semi-fast pace. We played the Old Course in very benevolent weather and favourite holes were the 10th, 14th, 15th and 17th which echoes previous comments about the second nine being more fun. Must also agree with previous reviewers that the members we came across were extremely welcoming and helpful. This was my first visit and I hope it won’t be my last. As a foreigner I have played my share of links courses, RstG, RCP, Saunton, RND, Silloth, RLstA, Rye etc. Seaton Carew is not easily reachable and you have to plan your trip. As mentioned by other reviewers the road towards the course is no tell tale of what lies ahead of you. We played the Brabazon lay out with the four Pennink holes and it was a joy to play. The inward nine provide for a great test of links golf and, believe it or not, a great scenery. Or only disappointment was the unnatural amount of buckthorn. A wide hedgerow of buckthorn running on the right of the 12th holes even had a clearing at slice distance form the tee??? A very positive remark has to be made about the very welcoming members. Since the lay out varies with 18 holes being selected form the 22 it sometimes is confusing. A lady golfer from the preceding group waited for us at the 6th green to help us with direction to the next tee. We have never experienced so much friendliness, we owe her a big thank you. Played this the day after playing Ganton and whilst the links is very different it is a fine track and an excellent test of golf. This is classic links golfs as good as most links courses I've played north or south of the border. The greens were firm and fast, a real treat. The rough was tough enough to punish a wayward shot, but not so bad that you couldn't find your ball... not when we played anyway. The back 9 played into the wind so several holes became difficult to reach in regulation without hitting a driver. The front 9 played a little easier and shorter with the wind behind, so the emphasis was on accuracy not trying to overpower the course. This is great value for such a good links course, and it has little competition in the locality.